Mike Manclark and the Mangic Foundation announced today that they’ve returned as the longest running sponsor of the nation’s largest air show at MCAS Miramar. Mike Manclark has been sponsoring the event for 21 years straight, which delights hundreds of thousands of families and aviation fans who come for spectacular air displays and a look at some of the most unique and inspiring aircraft in the world. As a premiere sponsor, Mike Manclark is sharing his exclusive access to a 100-seat VIP chalet located alongside the runway for a truly spectacular vantage point directly in front of the Blue Angels. As in other years, Mike Manclark will use the Chalet to host hundreds of families from all branches of the Army, Navy, Air Force and Marines throughout the weekend. As his way of saying thanks to America’s service men and women, Mike Manclark will treat them to Matinee and Twilight shows with the renowned U.S. Navy Blue Angels, U.S. Army Golden Knights, U.S. Navy Leap Frogs, extraordinary parachute teams, and other amazing aerial demonstrations. Support for the veterans and active military is a Manclark family tradition and spans multiple generations. Mike Manclark became involved with the Semper Fi Fund nearly 15 years ago to support post 9/11 critically ill and injured members of all branches of the U.S. Armed Forces. A community leader, entrepreneur and pilot himself, Mike Manclark has overseen dozens of events which raised six-figure funds for the severely injured marines; donating similar values in personal capital and goods. In addition to sponsoring large fundraising events, Mike has engaged over 100 children to contribute lemonade and bake sales proceeds to learn the value of giving back to the community and showing that they care. The Mangic Foundation believes deeply in making the quality of life better for those in need, underserved and forgotten. The money goes to important causes making a difference in Orange County, America, the Caribbean, South America, Africa and other areas of need globally. Semper Fi, Half-Million Meals, Bahamas Orphanages, Freedom Dogs, school scholarships, and Readers in the Outfield are a few of the charities benefiting from the generosity of MANGIC donors. 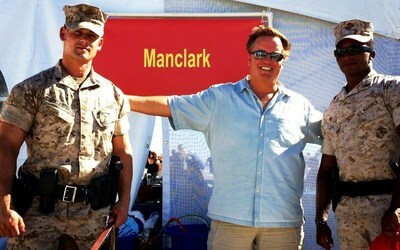 For more information on the MCAS Miramar Air Show, visit http://www.miramarairshow.com.